This isn’t any old transplant job, this is a multifaceted, strategic approach to protect your precious babies from moles, voles, rabbits, birds, and all those critters that wander the night. After a little research I learned of several practical ways to protect the precious baby bulbs from threats of all kinds. 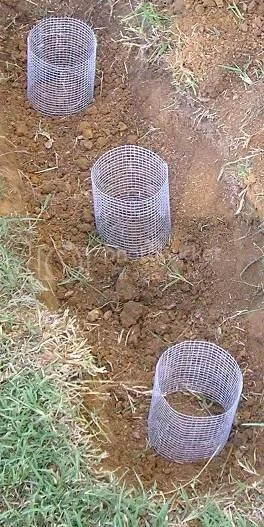 I have read of people, going as far as, adding a layer of crushed glass under the lily beds to stop voles from digging and eating the bulbs. Sharp gravel is another way to protect lilies and other bulbs from underground predation. I opted for a less drastic and more removable method by making a tube out of hardware cloth to protect the bulbs. The dimensions are approximately 5″ tall x10″ circumference. I used an old yougurt container to establish the shape. 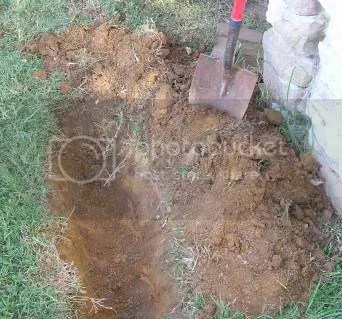 I dug an extra deep hole to loosen up the dense clay soil. Next I mixed grass clippings with dirt and filled in the bottom of the trench. 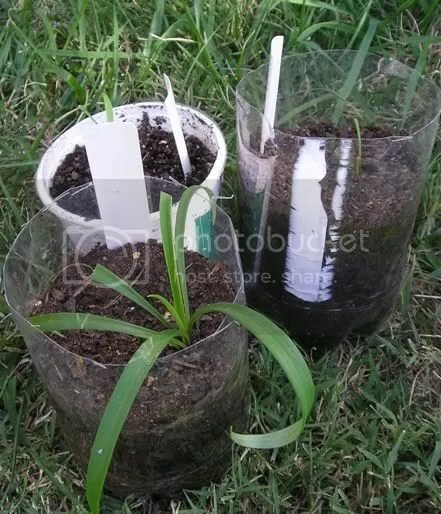 I added a dose of Fish Emulsion to the bottom of the hole and then planted the seedlings into the tubes. Just the other day I bragged to DH at how my lily seedlings had really taken-off. I must have jinxed myself because the day after two of the plants that had, up until then, grown safely on the shaded front porch were decimated, the leaves ruthlessly snipped off and lying there limp and lifeless next to the plants. Don’t the birds have anything better to do?! Like eat worms and insects. I also have a huge problem with moles, there are everywhere, in the front yard, in the backyard, in the neighbors yard, everywhere, not to mention the rabbits, who eat everything, as soon as, or before it starts to flower. I ran out of space in the front flower beds with all Spring bulbs I planted, so I had to dig into fresh earth to make room for the lilies. I was careful when I chose the site to make sure it was in the best possible draining area I could find. There are three downspouts on the front of our house, all of from draining into the flower beds. Although there is a downspout just feet away from the new lily bed they are above ground. I have already had an experience with rot. Once day I noted the leaves of one of the seedling were yellowing, my first thought was, “oh, a little fertilizer, that’s all it needs.” But then my second thought was “uh, oh, that’s not a good sign.” I did my due diligence and quickly proved that yellow leaves is one of the first signs of rot, repotting my be necessary, but in my case it wasn’t. I had been watering too much, as was my habit during the hottest days of the Summer, but when the weather became more temperate they didn’t need as much water as I was giving them. The yellow leaves quickly shriveled up and new leaves emerged. Water logged areas can also lead to a higher incidence of disease. Here is the bulb under the Formosa Lily seedling. I started these from seeds early last Spring. I have three different species, Lilium Pumilum, Lilium Lankongense, and Lilium Formosanum. Not surprisingly, the vigorous Formosa Lily that often grows in roadside ditches in my largest plant. I back-filled everything and finished by watering them in with some worm tea and a root starter solution. With the chicken wire cloches on, they are safe from rabbits, birds, and anything else that tries to bring them down.